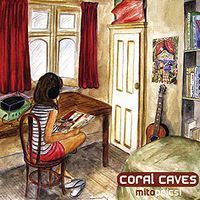 Coral Caves is a young italian band but less 'italian' than necessary. In this album they mixed a neo progressive with italian melodic symphonic moments and something else. Forgetting about the vocals and the drums, you will find good guitars and keyboards minutes. After a while listening to this album I really started to think in the future they can deliver a good instrumental progressive. It seems they need to visit the old bands like Banco del Mutuo Soccorso and P.F.M in order to find a REAL italian inspiration and lose the english neo progressive. When the vocalist is singing we realize they are italian, but once the vocal stops we forget which album we are playing. Some moments are too british, Floyd, Camel or Marillion. The guitars sounds like Latimer or Gilmour, very beautiful and melodic, but as I said they need more italianism. They also need to improve their experimentalism. Mitopoiesi remembered me the middle records of Le Orme like Smogmagica mixed with something close - and worst - to Nuova Era. It's a good effort. Probably a four stars album for neo progressive fans, but not for the old italian ones. It's better than some other young bands like Notabene, but in the future they can do better if they forget there is a country called England.